There is a verdict from a German court to the violation of the GPL license! A university in Germany was using Open Source Software to manage end user devices in their Wireless Network. The OS Software was/is licensed under the GPL license. The university was offering the students a binary download without referencing correctly to the GPL license and without offering the source code of the binary as download as well. The copyright owner of the OS Software sued the university because of violating the copyrights of the used OS Software. The amount in dispute is 50K EUR. That means you have 30 days to fix the problem if somebody notifies you about a violation. BUT the court decided that violating the copyright laws the very first time is reason enough for a punishment. Giving the university the chance to fix the situation in the first 30 days means they are allowed to use the Software in future, but it doesn’t prevent from punishment in the first place. Otherwise everybody would simply violate copyright laws with knowing they get anyway a 2nd chance for free without getting sued. Most companies think Open Source Software is always for free. But that’s not true! OS Software comes with a wide range of licenses and companies have to deal with that. There is no modern Software development without Open Source! Software Developers are using Open Source Components every day in their daily business. There is no way around. And the risk of accidentally using a component which is licensed under GPL in a closed source project is not too small. 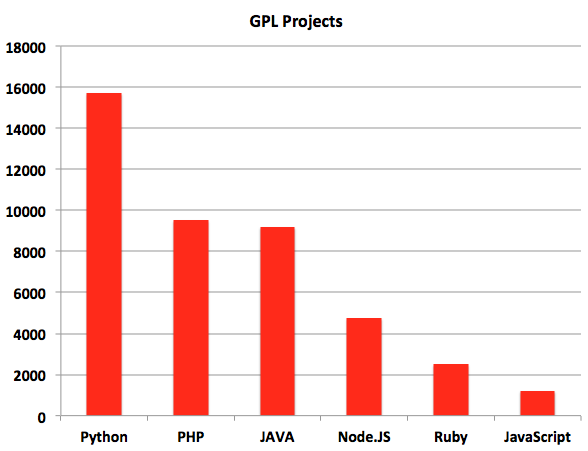 Here are the numbers of Open Source Components which are licensed under GPL, separated by programming languages. Do you have a license whitelist for your development process? How do you ensure that your developers are not accidentally pulling in a GPL component? With VersionEye you can setup a license whitelist and VersionEye can check on each build your license whitelist against all your project dependencies. If there is a license violation we can even break the build and prevent you from shipping GPL code to production. Write an email to support@versioneye.com if you are interested.